By 1910, Harrogate was at the zenith of its popularity as the leading spa in Europe with over 100,000 treatments given in the spa annually, 6,328 visitors per week were recorded and over 120 passenger trains entered each day. Offering ‘the cure’ from the spring waters of the naturally occurring artesian wells, Harrogate became renowned as a second home for visiting royalty for the season. The Royals soon recognised that staying in a hotel or small rooms did not provide them the opportunity to offer hospitality to other visiting nobility or hold court. So emerged the advent of Royals renting apartments where they could privately entertain in grand style in spacious, elegant rooms. Royal Parade was named because it was indeed where the Crowned Heads of Europe promenaded and was known as ‘the place to be’. 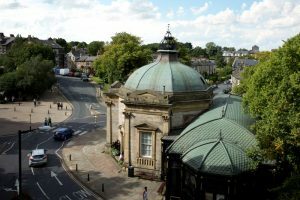 Consequently, 9A Royal Parade became the ‘place to stay’ as it directly overlooked Harrogate’s most prominent spa, The Royal Pump Room, where literally thousands of people came to take the waters each day. Royal Parade was built in 1846, just after the construction of the Royal Pump Room. 9A was designed to offer accommodation that would befit royalty, with grand entrance hall, wide sweeping staircase and high ceiling and offering three large apartments on three separate floors; all with stunning views of the Royal Pump Room gloriously domed copper tiled roof and the cobbled picturesque Crown Place. 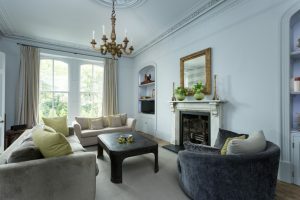 Royal Parade Apartment-Hotel offers the perfect Car Free Break. 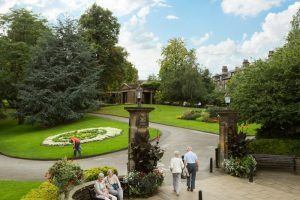 The whole of Harrogate’s amenities, including restaurants, cafes, bars, shops, and it’s railway station, are within a few minutes walk. A stone’s throw away is 17acres of Valley Gardens, chosen by Allen Titchmarsh as his favourite public park in England. It is possible to walk through Valley Gardens through to the Pinewoods. This provides 96 acres of semi-natural woodland with predominantly native and indigenous trees. This 1km walk then leads on to the Royal Horticultural Society Centre of Harlow Carr Gardens. These 58 acre gardens stand on what was once part of the Forest of Knaresborough, an ancient Royal Hunting Ground. Here you can enjoy some of the best horticulture in Yorkshire, which is open 364 days a year. The varied landscapes include woodland, streamside and wild-flower meadows. We are proud of our historical association with Harrogate. Royal Parade was aptly named because it was indeed where the Crowned Heads of Europe promenaded when Harrogate was the zenith of it’s popularity as the leading Spa in Europe.